Should First Time Home Buyers Consider Adjustable Rate Mortgages? Should a borrower applying for a first-time home loan consider an FHA adjustable rate mortgage loan? Is it possible to save money with a new home loan that doesn’t have a fixed interest rate? FHA home loans are great choices for first-time home buyers, but the options may seem confusing at first. 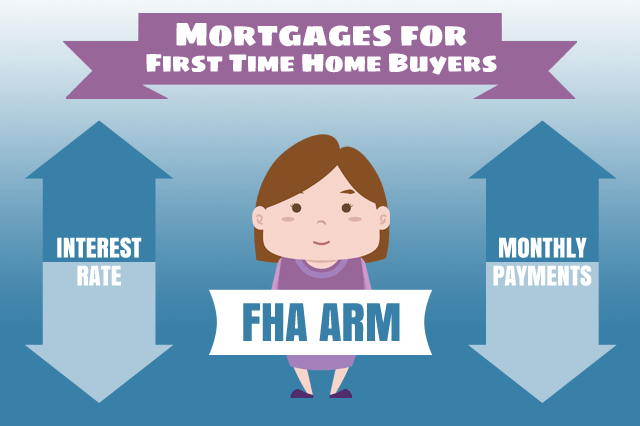 February 3, 2019 - FHA home loans are great choices for first-time home buyers, but the options may seem confusing at first. Should a borrower applying for a first-time home loan consider an FHA adjustable rate mortgage loan? Is it possible to save money with a new home loan that doesn’t have a fixed interest rate? Like all home loans, an FHA adjustable rate mortgage (ARM) requires some negotiation between the borrower and the lender. This is because FHA ARM loans will come with an introductory rate that may be lower than other interest rates open to you depending on credit scores, credit history, and what the lender is willing to offer. The introductory rate may be good for a single year or as long as ten years. Once the introductory rate period ends, there will be an interest rate adjustment that is regulated by FHA loan rules-the adjustments can only be adjusted up or down based on the FHA guidelines and lender standards. State law may also have a say on how such loan transactions are managed. How Much Rate Adjustment Is Permitted With an FHA ARM Loan? FHA home loan rules in HUD 4000.1 regulate the interest rate adjustments on FHA ARM loans. Five-year ARM loans may be adjusted by two percentage points annually, and six points over the lifetime of the loan. Seven-year ARM loans and 10-year ARMs may only be adjusted by two percentage points annually “after the initial fixed interest rate period, and six percentage points” over the lifetime of the loan according to HUD 4000.1. Borrowers who are not planning to keep the home for the lifetime of the ARM loan are in the best position to use the loan to their advantage. There is no early payoff penalty for FHA mortgages and that includes adjustable rate mortgages. If you sell the home in five years or ten years following the initial adjustment rate, you avoid future rate increases. But you can also do the same thing by refinancing the FHA ARM loan using an FHA Streamline Refinance mortgage into a fixed rate loan. That’s something to consider when planning the first-time purchase of a home.